Subtractive synthesis has long been the most established and prevalent form of synthesis. Like a good pair of well-worn shoes, it provides the user with a familiar environment, which can be taken from one synth to the next. Bolt, however, is billed as a Harmonics Synthesiser, which gives us a pretty fair clue about the way it operates. In essence, Bolt is not so much about starting with a waveform which is full of harmonic content and subtracting harmonics from the top down (as we tend to with a low-pass filter), as it is starting from the bottom upward and opening up the harmonic content until we have what we need. So far so good, you might say, but things get a little more controllable and complicated: so let’s start where the magic happens, with the oscillators. Each patch can consist of two independent oscillators, with each offering the main oscillator tone and a sub-oscillator beneath it. The building block of the main oscillator is a sine wave, which can be extended by adding harmonics over the top. This is done by increasing the harmonics control which, unsurprisingly, adds the harmonic content in order; this process is not dissimilar to opening up a low-pass filter, but of course, the essence is on ground-up, and not top-down. Looking beyond this obvious similarity, you become aware of a great deal of control. With each turn of the rotary dial, the digit displayed in the area below will give a concrete clue as to the number of harmonics in play. So taking the fundamental pitch as 0, and adding a value of 4 will give you five distinct tonal entities, all of which may be viewed within the Oscilloscope window, by clicking on the centre. This visual alone is fascinating, and eliminates any guesswork should you find yourself operating Bolt with a degree of OCD. Right next door to the Harmonics control is the Rolloff which, slightly confusingly, adds further harmonics without the need to change the Harmonics pot. However, it does so by ramping any added elements in a beautifully controlled and musical way. It’s possible to add up to 20 harmonics in total, meaning that the basic tones can be rich or simple, depending on the sound you’re attempting to create. In its default state, Bolt’s oscillators produce a sine-to-saw-styled wave, complete with all the incremental harmonics that one might expect. Yet if you dial in the button labelled Odd, Bolt delivers a wave which is square in shape, as every other harmonic disappears from being audible. Regardless of this mode, the Rolloff control continues to operate in the same way, ramping and further adding harmonics in tune with square-wave credentials. Pressing the button labelled Deep delivers more bottom end, sculpting the waves into either sharper saw or square shapes. Each oscillator also offers white noise which, curiously, is controlled in the same manner as the main timbre with upper-harmonic content added (much like the more usual filtration model); while a sub-oscillator mirrors the main oscillator’s credentials. What’s great here is that a mere changing of sub level will throw open all sorts of interesting colours, which is quite different from the sort of thing you might hear on a conventional synth with a sub-oscillator, and I think this is where Bolt starts to come to life sonically. 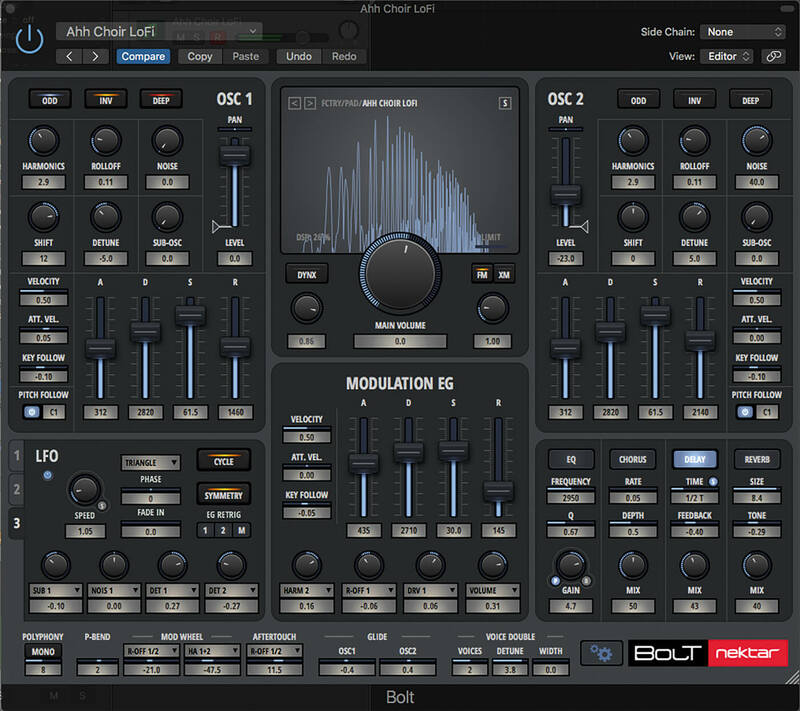 The general sound of Bolt feels pretty digital, with slight reminiscence to some of the early FM synths from the 80s. I think this could largely be down to the front-loaded construct of each timbre, along with the immensely satisfying amount of control that becomes apparent, even from just playing around with the oscillator. What becomes even more appealing is the ability to control all of these elements from modulation sources. Even just placing the level of the sub oscillator under LFO control creates a beguiling subtlety of sound, which feels like Bolt is organic in origin. 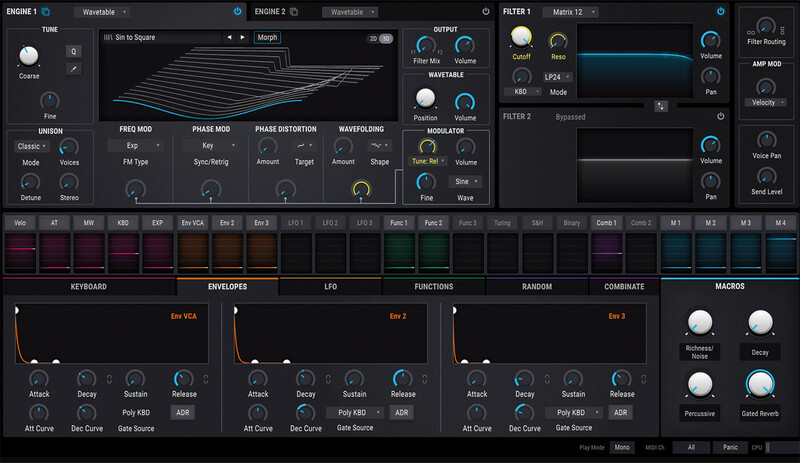 The LFO section also offers plenty of options of wave type and syncing to the DAW. As there are three LFOs available, the possibility for clocked sounds is pretty substantial. This quickly becomes an area for creative exploration, yielding interest and plenty of scope for strange happenings in control of any type of oscillator element. It’s worth reminding ourselves at this stage that the previously described main oscillator has a completely independent and mirrored oscillator. Oscillators 1 and 2 are found either side of the useful Oscilloscope, making it clean, clear and very usable, while buttons located in this position will allow interplay between each side via FM and X-mod. In these instances, gnarly tones emanate easily, resisting any ultimate nod to the FM synths which dominated the mid 80s. Continuing the degree of independence between each side, and each oscillator is equipped with its own ADSR envelope, specifically for amplifier duties, while the more central modulation envelope allows for control without interfering with the volume side of the construct. Oscillators also offer individual panning and overdrive, although I found that the latter could be easily missed, as it is indicated by small triangles immediately next door to the oscillator volume fader. At the current time, Bolt does seem to place considerable loading on the host computer. Working on a high-spec current generation MacBook Pro, I saw CPU loadings stabilise at around 60 per cent of my machine’s capacity while set to a modest 256 buffer size and playing polyphonically. This could restrict the degree to which it might be used, but I’m guessing this is more likely to improve over time as updates appear. Overall, though, you have to admire this as a first release from Nektar, and its slightly different approach will not be difficult to grasp for most synthesists who possesses a basic working knowledge of subtractive. Bolt is pleasurable to use and easy to understand, while offering 16-note polyphony alongside a backend of EQ, chorus, delay and reverb. Even without these additions, the pan summing means that it’s possible to create complex tones that feel fulsome in the stereo domain, and it’s pretty distinct in sound. Where the oscillators can sound dated in some pure instances, modulation and overdrive will bring these right up to date, making Bolt sound punchy and modern. If you’re looking for a modestly priced synth with character, this is a good place to start, particularly with a free downloadable demo to try. 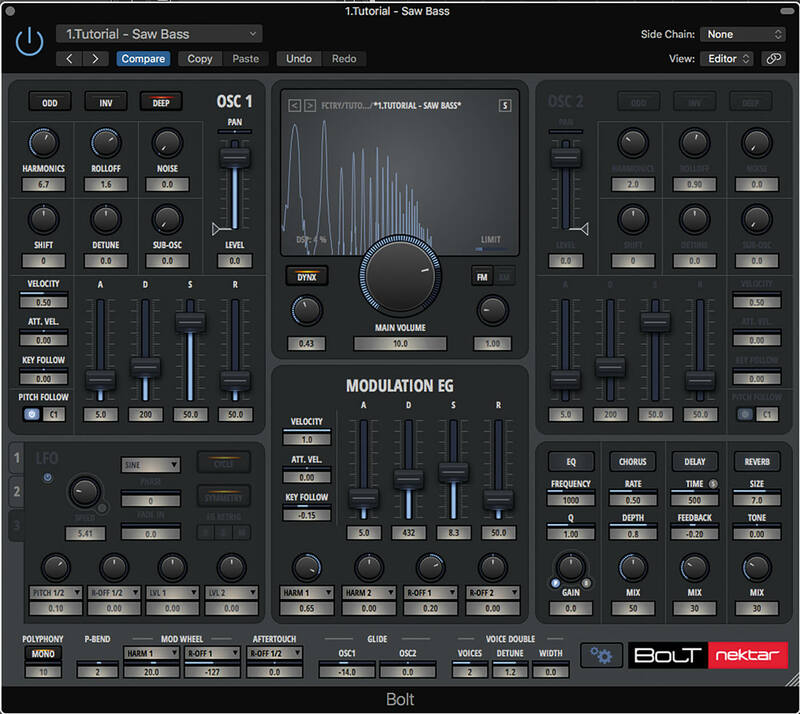 Despite the slightly different way that Bolt arrives at synthesis, it offers a reasonably easy-to-use interface which is very efficient and large in presentation. As its construction is somewhat traditional (even if it doesn’t employ a traditional filter), it does sound fairly similar to many subtractive soft synths, but without the option for choice of filter colour. It will require the user to approach the building of certain sounds slightly differently. It overdrives nicely, and movement can be created from the usual modulation sources. It’s a synth that delivers straight down the line, as opposed to going out to the extremes, but that’s not entirely surprising. More expensive plug-ins could doubtless do more, so it does rather depend on the sort of sounds you hope to gain at the price point. It’s certainly fun to use and creative, too. 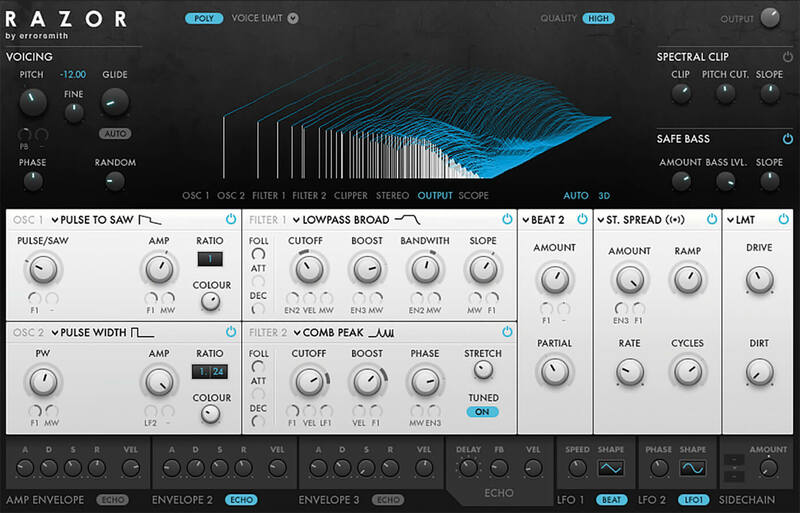 This additive-based synth from Native Instruments has something of a reputation for giving the user sharp and controllable sounds, built from the ground upwards. It’s pretty easy to use and dynamic and offers elaborate visual feedback, to provide guidance to the user as patches are created. This newbie from Arturia has some clever modulation technology on offer, especially of the waveform, which can provide terrific movement in the sound. It’s a little more expensive, but is also offered in trial form, so you can safely try before you buy. It also looks pretty gorgeous.